Despite the popularity of the original, HOKA has completely revamped the Speedgoat with this latest iteration. A wider forefoot provides much greater stability, and a stacked midsole gives nothing away in terms of responsiveness – but does feel firmer and more stable than in the first version. A Meta-Rocker midsole encourages forward movement even on tired legs and the Vibram Megagrip outsole does exactly what it says on the tin. Ready to take your running off-road? 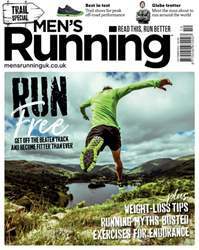 Then make sure you pick up a copy of the October issue of Men’s Running – our trail special. If you’re a persistent pavement pounder, or are completely new to running altogether, our Beginner’s Guide to Trail will tell you all you need to know about picking the right kit, finding the right routes and tailoring your training for efficient running away from the asphalt and tarmac. We’ve also got exclusive reviews of the latest trail shoes, top-to-toe kit suggestions for every off-road scenario and the latest tech to keep you on track. If it’s inspiration you’re in need of, our lead feature – a stunning trail runner’s guide to the Jurassic Coast – will have you leaping over your nearest stile quicker than you can remember you’ve only just cleaned your trainers. And don’t worry, if trail really isn’t your thing, we’ve also got the usual training advice, race reports and nutrition know-how to help you run stronger than ever.